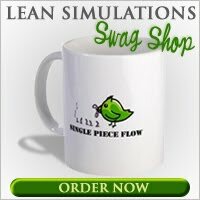 Most lean games and simulations run in phases, contrasting the traditional batch production techniques with lean single piece flow processes. Whether you use paper airplanes or pennies, these games are perfect for really showing people the differences. When you experience single piece flow in a hands on activity, it's easier to internalize the key parts, so it will come back to you when you're working on your own projects. For those times you don't have the time or space to run a full-fledged game, however, nothing beats video. Sure, you can describe single piece flow by comparing Subway sandwiches to a batch barbecue party. Examples help to hammer the point home. But many people are visual learners and need to see for themselves. The video below shows the primary benefit of single piece flow using a simple, graphical illustration. Single piece flow shortens the lead time. It's as simple as that. You can show this with a lean game and get your teams to compete against each other. Or you can show this 47 second video! In "real time", you can see how quickly the customer receives their order. You can see the reduction in inventory. You can see less work in process. And you can see the order fulfilled in 29 seconds vs 60. Half the time! Imagine how much time you save with a longer chain of processes. Because the video's so short, you can easily work it into your session, between phases of a lean game or after a more intensive sit and listen session. Just remember that when you shorten your lead time, you become more flexible. And in these uncertain economic times, who wouldn't value flexibility over heaps of inventory. I've added this video to my list of lean training videos. Check it out and feel free to comment on your favourites! Nowadays credit karma is just one of the most trending as well as Official Link Their fears include how they can pay the fund of their youngsters education and learning.